Whats all this humid weather about? the 3 mile warm up with my friends John and Trevor was already working up a sweat, maybe it was the fact I told him after the race we had another 10 + miles to run for our marathon that was in a few weeks. I know I am cruel! Anyway another great race for a course PB by nearly a minute and finished in 36.37 after a heavy weekend of training, if only Paul Daniels could have waved his magic on me to run even quicker! A great trophy to add to my collection along with some race vouchers and a first ever win at Wargrave. 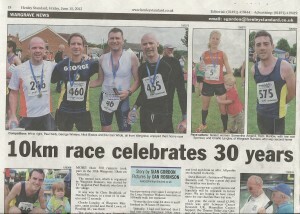 Another great organised race, lovely rural settings.